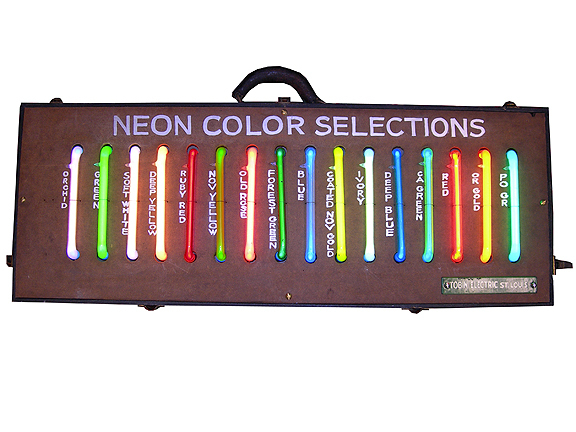 description: A custom made salesman sample display case for neon colors by Tobin Electric Sign Co. Sixteen vibrant colors were available to the Tobin customers. The trunk has a removable lid allowing safe transport of the display. A detachable cord supplies power. information: Although Tobin no longer produces signs, it still operates today as a hardware company. The display was assembled in a Herkert & Meisel Trunk Co. 910 Washington Ave. , St. Louis, Mo., a very popular trunk & luggage store.